CURRENT KYNETON AIRFIELD LOCAL LAW NO. 12 Is On Exhibition Until 7 February 2019. The Local Law is intended to benefit only the users of the Kyneton airfield, and stakeholders in it. It's put forward on the basis that it 'improves' safety. 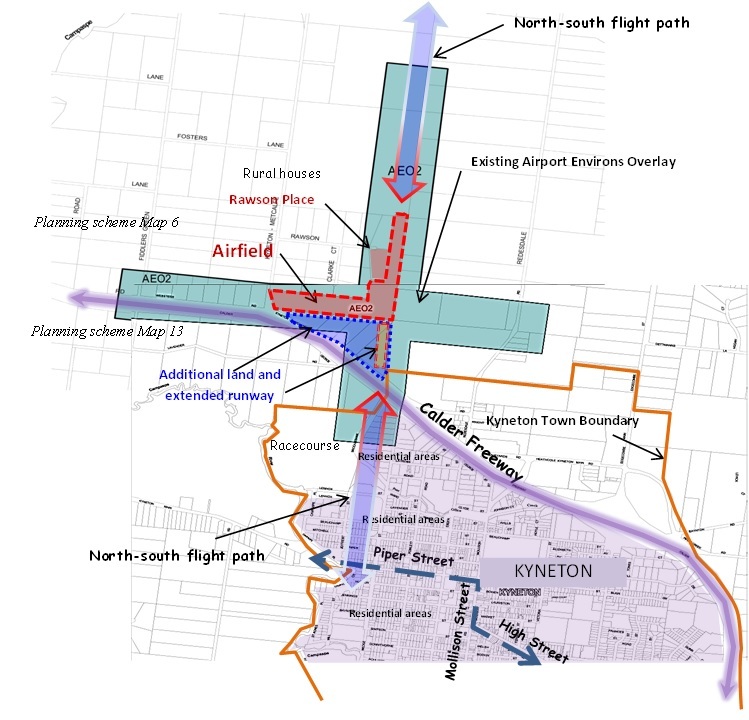 However, because it affects an area (circle) 2.75km from the centre of the airfield, and includes the northern half of the Kyneton town centre itself, as well as numerous rural and industrial properties, it directly affects and potentially penalises a large number of existing town residents and businesses. It also has a retrospective effect in that it requires changes to be made to existing (until now lawful) circumstances rather than introducing change from the date of its approval. A Community Impact Statement (that doesn’t actually address impacts on the community) which Council adopted on 28 November and resolved (at part 5 of the resolution) to provide on Council’s website, is not available from that website. The Local Law itself refers to having ‘incorporated’ documents, and residents having to comply with them, but doesn’t provide or even name them, which is believed to breach the requirements for making a Local Law. There may also be problems for Coliban Water because the Community Impact Statement says its sewerage treatment ponds next door to the airfield attract birds, and the Local Law says it’s an offence to not take action to prevent circumstances that attract birds within the airfield environs. It's also an offence to do a lot of other things. The map included in the Local Law is barely readable, and the OLS (Obstacle Limitation Surface) diagram is likewise almost unreadable, and doesn't seem to provide much useful information relevant to working out height restrictions. Here we go again. This Local Law relates to yet another of the last Council's fanatical economic development "pet projects" (Kyneton airfield expansion), with the Local Law trying to make a 'silk purse' out of the sow's ear that is the Kyneton airfield. Not well done, either. With this one, it's past time to take a long hard look at how ridiculous it is to try to persist with either the existing or any expanded activities at this airfield. It's too close to the town even for the existing level of activity. The previous Council didn't let a completely inappropriately located airfield get in the way of its mindless pursuit of economic development, or with its equally mindless intention to drive a lot of population growth into the town that is already adversely affected by the airfield's presence. Classic land use conflict. It's time to get back to basics and make an honest, unbiased assessment of this unregistered airfield's location and other inadequacies and the risks it poses to third parties, even from existing activities, and at long last seriously consider moving the airfield away from the town, or shutting it down. (24/5/16 - C) Deja-vu here as Council says revenue from the airfield isn't enough for its upkeep. Council's answer? No prizes if you said, how about tripling flight operations, and commercialise, commercialise, commercialise public land - oh, and extend the main runway 300 metres closer to the town. Current 24/7 operations introduced in 2014 are already driving residents crazy. Macedon Ranges Shire Council owns and manages the Kyneton Airfield and adjoining land at 8 Rawson Place in Kyneton. That seems as good a reason as any for Council to think it can turn this public land over to private commercial interests and give the airfield an "economic-development makeover", reminiscent of Council's economics-bloated Hanging Rock and Equine 'Everything' Centre proposals. The draft Kyneton Airfield Masterplan, currently on exhibition, includes the publicly-owned airfield and 8 Rawson Place, and adds (privately-owned?) Farming zone land to the south for new commercial activities and a 300m extension of the north-south runway. The Masterplan suggests the landowner to the south is supportive of this change, but doesn't say who the landowner is, whether Council is buying/has bought the land, or what future ownership arrangements are contemplated. It would certainly be offensive to residents if Council buys this land while crying poor when it comes to spending on improvements the community wants, and flogging off public open space all over the Shire "to make ends meet". You also have to wonder why Council wants to create more industrial-style land in a town with 180ha of existing vacant industrial-zoned land. The airfield is currently operated under a service agreement with Council by Kyneton Aero Club. The airfield operates with uncontrolled airspace, and the use of the site is not regulated by Council or the Aero Club. The airfield is not registered with CASA (page 5), and existing structures apparently don't conform to current air safety standards. The Aero Club runs a flight school with flight training operations, including “touch and go” landing practice runs, additional to other recreational use of the airfield. In February 2014, Council received State government funding for infrastructure which enabled introduction of night operations and 24/7 self-service runway lighting and refuelling facilities. One of the Masterplan's purposes is said to be, "Consider surrounding land uses and address potential impacts that may result from the development of the (airfield, etc) site." Hard to believe that when the Masterplan doesn't even admit or show the existing airfield is only 600m from existing residential development within the Kyneton town boundary. It instead says the airfield is 2km from Kyneton, and only vaguely acknowledges residential development by saying "some sensitive areas including accommodation exist near the airfield site" (page 19). It also doesn't say that if the runway is extended 300 metres south up to the Calder Freeway road reservation, the airfield will only be 300 metres from township housing. Planes already fly low over the township, including those "touch-and-go" practice runs, and over populated rural areas (Farming Zone) next to the airfield - populated because at one stage or another, Council approved houses there. "At present the financial operations of the airfield are quite simple. The airfield pays rates which are retained by the Council for use in its normal operations. The Council receives approximately $8,500 from the hanger site leases and these funds are returned to the Kyneton Aero Club, as a means of assisting with their operational costs." Instead of introducing rent and increasing user charges so ratepayers aren't in essence subsidising airfield operations and private clubs/businesses, the Masterplan plays the card of needing to accommodate fixed wing fire-fighting water bombers - and then "by the way" pops in increased flight training, more commercial and recreational hangars (additional to the existing 34), commercial helicopter operations, "airfield-related" commercial development, accommodation for fly-in, fly-out pilots (read, hotel/motel), and an air museum, although the "master plan" is short on details of all of it, for example, what does "aviation business" and "commercial precinct" mean? Fire-fighting helicopters are already able to and do use the airfield when required. The Masterplan notes at page 7 that the jet fuel they use is not available at the airfield except via portable tankers, but doesn't propose installing permanent facilities. And although the 300 metre runway extension southwards towards the town is said to be needed to allow some fixed-wing water-bombers to land safely, the Masterplan itself states at page 17 that correction: a Piper PA-31-350 Navajo Chieftain the two larger water-bombers concerned could be used "if the north-south runway were extended by a further 65 metres". The Masterplan claims expansion of the airfield and its commercialisation provides principally for broader community benefit i.e. water-bombers (page 22). However as the Masterplan states (page 2) that the airfield is used for recreational flying and flight training provided by the Kyneton Areo Club's flight school with only "occasional aerial fire-fighting activities undertaken by contractors on behalf of the CFA", any broader community benefits are immediately offset by comprehensive year-long community disbenefits, and that's before considering the imbalance of substantial existing and future benefits to private enterprise from cheap use of public land. The Masterplan says these proposals also benefit adjoining landowners by allowing planes to be at greater height when flying over private properties (page 22), a statement which breath-takingly - again - overlooks the fact that extending the runway south to within 300 metres of town residential areas, heightens the impact on those town areas. Council ties this clunker of a fantasy economics package together by proposing to rezone the airfield and its surrounds to... yet another Special Use Zone. Council also promises a "review" of the Design and Development and Airport Environs Overlays currently applied to the airfield, which, in Council's time-honoured practice, is likely to result in far fewer requirements for applicants/operators than now. Council will also "review" governance and operational matters for the airfield, but only after adopting the Masterplan (page 2). Overall, the Masterplan is dishonest, ambiguous, incomplete and disingenuous - in other words, up to Council's usual standard. It ignores the residential development (including the town) already detrimentally impacted by current airfield operations - while planning for a three-fold increase in those impacts - as if they aren't an issue. The document, like Council's equally-deranged Tourism, Equine and Agribusiness Strategies, is blind to adverse impacts on others, and the environment. It promotes economic development and private interests over the community's interests, and on land owned by ratepayers. As shown during a 'consultation' in 2012, most of those who supported the airfield and its expansion live outside the Shire, leaving locals to live with the effects of their activities. Local concerns aren't taken seriously. There are strong liability overtones for Council - and ratepayers - in expanding the airfield's operations in its current location, not only in terms of additional pollution over the town itself, but considering the extent of population in close proximity, an air crash at or around this uncontrolled airfield could have catastrophic consequences. The airfield has now outgrown its current location. Either its operations are curtailed and wound back to pre-2014 levels, or plans to relocate the airfield must start now, and with urgency. Put in a submission to Council objecting to the Masterplan by 5 June. Improvements to the airfield to improve fire-fighting capabilities, if considered necessary, can be achieved through much smaller scale changes, then increase rental and user charges so ratepayers benefit from existing airfield operations. Find out more about making a submission by going to http://www.mrsc.vic.gov.au/Council_the_Region/News_Media/Latest_News/Draft_Kyneton_Airfield_Master_Plan See Update at "MRRA Says" below. UPDATE Since posting this item, it has been learnt that estimated costs to Council for capital works and potential purchase of land could be up to $595,000 ($375,000 without land purchase). It is also emerging that while extending the runway may create capacity for a fixed wing (retardant/suppressant) fire bomber to land at Kyneton, there doesn't seem to be any official plan to use these planes at Kyneton airfield. A longer runway would enable larger planes related to commercial and recreational activities to land. If fixed wing bombers (single engine air tankers - "SEATs") aren't used or based at Kyneton, changes at the airfield would be a community cost benefiting commercial and recreational activities, without a community benefit. According to the Kyneton Airfield Economic Opportunities Analysis (August 2014 - adopted by Council September 2014), governance arrangements for the airfield were recommended to be changed to a "most prudent" and more accountable Council-management plus Advisory Committee model, with a review of airfield governance to be undertaken in late 2014 / early 2015, and implemented by June 2015 (Council's service agreement with the Aero Club is identified as expiring in March, 2015). The Analysis also recommends preparation of an Air Operational Management Plan concurrently with preparation of the Masterplan. Council is instead addressing the Air Operational Management Plan after exhibition of the Masterplan (i.e. the Operational Plan has not been exhibited). This looks like another of Council's poorly thought-through, poorly executed, single-minded economic development projects, with insufficient/incomplete information, and a notable absence of credible justification for making any change at the airfield. The Masterplan not only fails to address existing amenity problems created by airfield operations (and noted in the Economic Opportunities Analysis), it fails to even identify the close proximity of the airfield to the town proper and that with an extended runway, separation would be only 300m. Consequently, the town's residents are expected to continue to sacrifice residential amenity and subsidise changes that primarily benefit private commercial and recreational interests. Say 'NO' to this Masterplan.